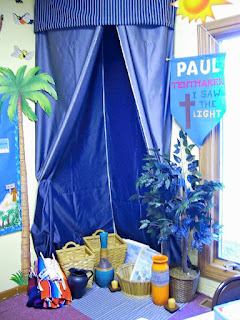 I have made several different types of tents for the kids to actually use while we act out the Bible lesson. This post shows some of them! I usually used this style for Abraham and Sarah. 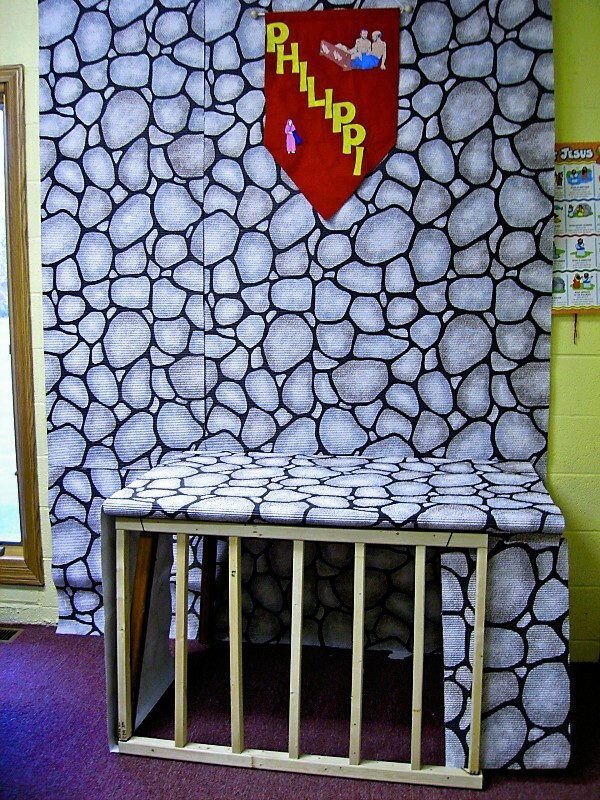 It is a table pushed up to a wall, and the fabric is attached to the wall or bulletin board. 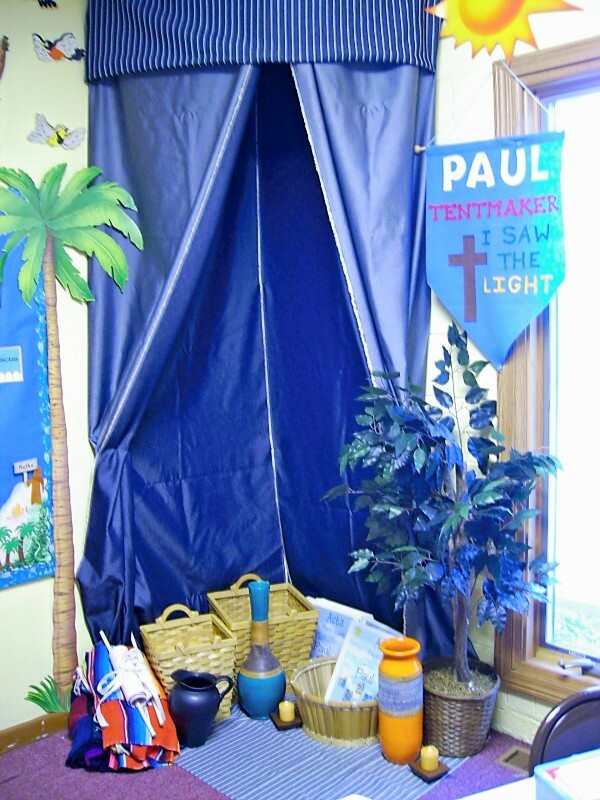 Adding fabric for the floor and a plant and pots, baskets, etc creates the look of a Bible time tent. They really like having the lesson on the floor! 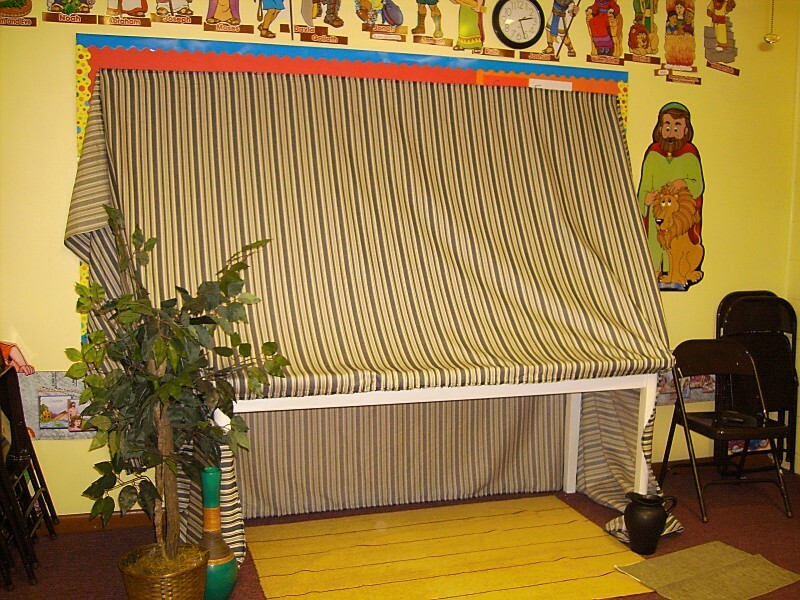 This tent stays up year round in my Bible class. 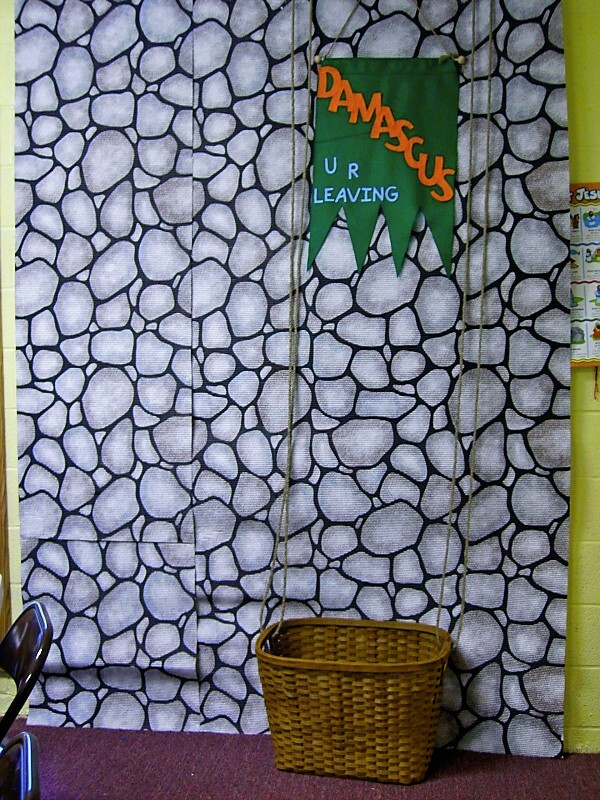 It is in the corner and I have used it for Isaac with Jacob and Esau, Abraham, Paul, etc. I change the felt banner for the lesson. Again, baskets, pots, blankets, plants, etc. finish off the look. 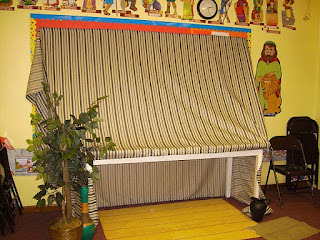 This corner is where I used the Daniel in the lion's den and used the same inside fabric The original idea is found in an older Ideashop Magazine, published by Gospel Advocate (which I really miss, BTW!). But there is another tent idea in Ideashop Vol.6, No. 1, Spring 1998, page 5, if you have the old copies. Newer version of the tent (different fabric) and different banner. There was a request for the directions, and it's been over 3 years since I put up the last one, but these directions should be enough to help you. There are lots of variables, depending on the fabric you use and your type of ceiling, so keep this in mind. Sorry, if they are not clear. I don't have photos of us installing our tents. Click here for the directions. First, you need to measure from the ceiling to the floor. Multiply times 4. That is the fabric you need for the tent. (The 2 inside walls, and the 2 from pieces that you see folded back.) Also a piece of fabric about 24" times the front two corners distance. How big the inside is will depend on how wide your fabric is.) And, 4 ceiling hooks. For the drop ceiling, something like these. For a drywall ceiling, hooks something like these. Here is the prison for Bible lessons, mostly Paul. Again, the kids love it. I bought prison chains/shackles at Halloween stores to add to the scene. 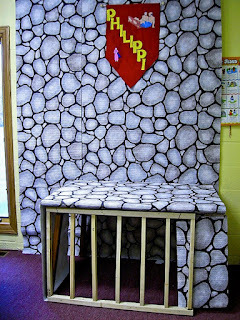 I used stone bulletin board paper, attached it to the wall, put a table in front of it, added my wood bars, and covered the table and one side with the paper. All reusable! And, too much fun! Another wall is Paul leaving Damascus in a basket. The stone paper was attached to the wall, and I found a very large basket. I added the rope to the basket and attached it to the top of the paper, underneath so you couldn't see the ends. The kids could sit in the basket, but REALLY wanted to be pulled up and down! Also, another felt banner was added. Any other tips or suggestions welcome! 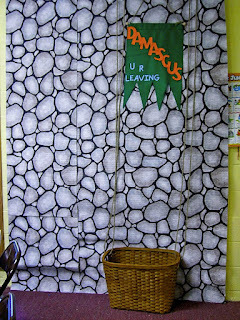 We are having a Sunday School Class decorating contest this month. I would love to use your idea. Thanks for the comment. I have added the directions as best as I could put them on paper! Yes, it is attached to the ceiling. Leave a comment if I should change or clarify something in the directions, as it's been over 3 years since we put it up. I put the directions on a pdf so it will be easier to print and use. I miss the idea shop magazine also. Sure wish they'd have it again. I'd love to have a lot more of the teaching class where the kiddos are more active in it but my room is very small. the table chairs takes up 1/2 of the class room. thank you very much for sharing your ideas.